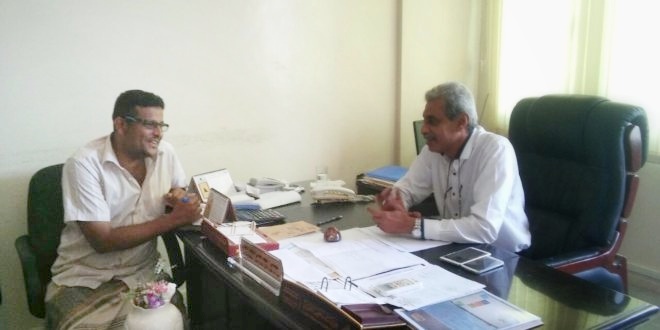 In a meeting between ‘Alwaqa Aljadeed’ the General Director of public works and roads in coastal Hadramout, Saeed Atef Alkaldy, find out the incision and maintenance of roads projects approved by the Prime Minister to Hadramout from its oil share (Dhabba Oil Terminal) during his visit to the province. Mr. Alkalday said that there are six projects were lifted adoption of its budget from the amount allocated by the Prime Minister to the streets of Hadramout. He stressed that it began working in the way of Hajar –Al-Joule – Kneena – Assadara at a cost of 57 million Yemeni riyals. 1. Completing the maintenance of shaher -Almady Raydet Almaria. 2. Streets of Mukalla city and its suburbs (Boaish, Rokob, Foah, Ryyan airport) projects. 3. Maintenance for Alhgela and Gail Bin Yamain and its interior streets. 4. Re-incision Sah Road – Risib which carried out incorrectly on the course of the floods. In the conclusion, engineer Alkaldy drew a word of thanks for ‘Alwaqa Aljadeed on the short gesture of interest in what is happening in the field of road network.